The Great Mosque of Tlemcen as a whole is an architectural masterpiece however, the techniques introduced in the construction of the mihrab dome are the most innovative. It is one of the oldest and best preserved Almoravid buildings in Algeria. Figure 1 - White horse arches raised on elegant piers were used for the aisles intersecting with other polylobed ones of the transverse arcades. The result achieved a great aesthetic impact. The rise of the Almoravids (Almurabitun) came at a time when the Muslim Caliphate in North Africa was collapsing. After a exhaustion of its resources due to internal fighting, the suffering devastation from the invasion of the Banu Salim and Banu Hilal tribes became widespread, destroying all signs of civilisation. The Almoravids swiftly established their rule on a region extending from low Senegal in Western Africa to the Mediterranean in the North, crossing later to Andalusia. Under their rule this vast region, of considerable geographical and cultural wealth, was for the first time united in one single nation. The Almoravid expansion towards the east, into Algeria, took place in the 1080's reaching as far as Algiers. Their leader Yusuf Ibn Tashfin founded the city of Tagrart, which became known as Tlemcen, in 1082. The building of this new city began with the construction of the main mosque, which Ibn Tashfin commissioned to hold daily and Friday prayers. Unfortunately, there is limited information available regarding what this mosque was like. Much of the existing structure belongs to the works undertaken by Yusuf's successor, his son Ali (11106-1142). An inscription placed the date to year 530 Hijri/1136 CE, making it one of the best preserved mosques of the Almoravids. 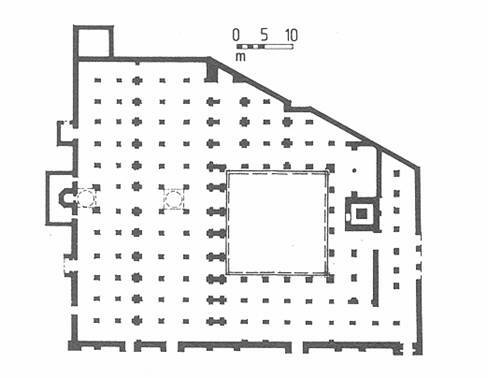 Figure 2 - Plan of the Great Mosque of Tlemcen showing the 12th century rectangular prayer hall with its central nave perpendicular to the Qibla wall and crowned with two beautiful domes. The trapezium section was added in the 13th century. The mosque has a plan of an irregular pentagon, of about 60 x 50 metres, consisting of two main sections . The prayer hall is a rectangle made of thirteen parallel aisles that run perpendicular to the qibla wall, typical of North African "T plan" mosques. These aisles are peculiarly made of horseshoe arches and intersect by transverse arcades of polylobed arches. It is assumed that they visually establish an internal spatial hierarchy . Figure 3 -The Mihrab dome is constructed of brick ribs intersecting with each other forming a beautiful star shaped pattern. The area between these ribs is made of carved plaster in the form of a screen produced by the vegetal carvings. 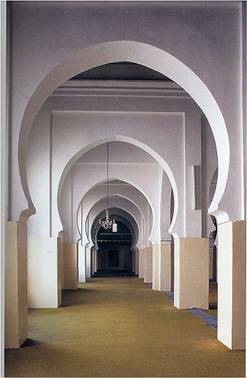 These lobed arches became an important feature of Almoravid architecture, seen in many Moroccan and Andalusian buildings, (e.g. Al-Qarawiyyin mosque and, Al-Kasar at Seville). The central aisle (nave) leads to the mihrab and as custom it was given special treatment. Two of its bays were crowned with domes, with the more spectacular dome being raised above the bay just before the mihrab. Resting on muqarnas squinches, the dome was mounted on sixteen interlacing ribs that create a star pattern. The ribs were arranged by delicately cut bricks that some writers thought at first were made of wood. Seen from the extrados, their construction technique closely resembles the approach adopted in the I-Jami' Mosque of Isfahan, Iran . The slender ribs, which were thrown from the side over the triple arches, intersect numerous times to create a large multi-pointed star at the apex of the dome, while the centre of this star is a sixteen-sided lantern embellished with muqarnas. Figure 4 - The mihrab with its Cordoban character. The surface between the ribs is constructed of beautiful carved plaster in the form of carved screen of vegetal decoration. In a similar fashion to that of the Great Mosque of Cordoba, the square base of the dome is enclosed within a maqsura. Shaped by the famous horseshoe arch framed by the Ijmiz incorporating bands of calligraphy and surfaces of arabesque, another element of the Cordoban influence is the mihrab. Historic sources indicate that both Yusuf bin Tashfin and his son Ali brought artisans and architects from Cordoba to Fez, hence the Cordoban influence is unsurprising . Further, disenabling one to rule out the presence of Cordoban artisans during the construction of the Great Mosque of Tlemcen. The trapezium section consists of the courtyard and the porticoes. Much of this part belongs to the 13th century extension which was carried out by ruler 'Abd al-Wadid, Yaghmurasan ibn Zayyan in 1236. The adjacent castle restricted the site resulting in this irregular shape. The typical North African square minaret is thought to have been added at this time on the side opposite the prayer hall, in similar arrangement as those in Qayrawan and Kutubiya. 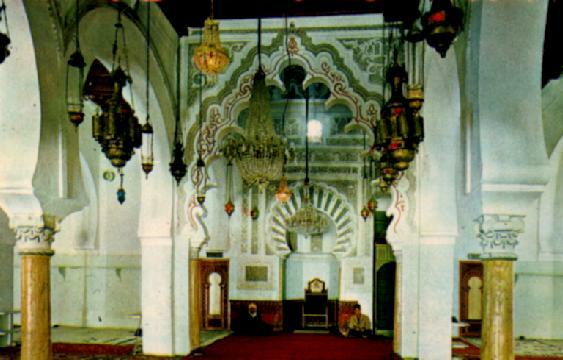 With the above features the Great Mosque of Tlemcen represents a unique example in the region, particularly in Algeria. In historical terms it is one of the oldest and best preserved Almoravid buildings in Algeria. Although the mosque as a whole is an architectural masterpiece, the techniques introduced in the construction of the mihrab dome are most innovative. It could well be said that these techniques inspired the Gothic rib vaulting, setting the foundations for the European architectural renaissance. Other important features include the visual scheme introduced by the clever use of the horseshoe arch for the aisles running perpendicular to the Qibla wall, alongside the polylobed arches for the transverse arcades that run parallel to it. This is an innovation that was to be widely used by the Almohads, the successors of the Almoravids, in many mosques in Morocco and Algeria  . Marcais, G. (1954), ‘l'Architecture Musulmaned'occident', Arts et metiers Graphiiques, Paris,p.196.